An Automatic Variants Port. The author of the textures is AlienSlof. This AVP has NOT been publicly available before (NEW). 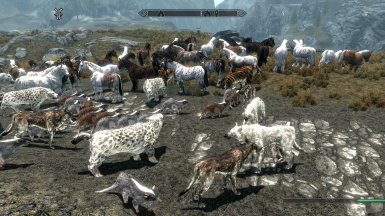 Contents: 47 textures: Horse(35), Zebra(5), Dog(1),Sabrecat(2),Skeever(2),Wolf(2). AV by Leviathan1753 makes it possible that when 6 horses are shown there is a change (depends on the dices) that all 6 use a different texture. 2012-08-03. Added the last 10 Horse mare. Used the textures from AlienSlofs latest update not the older ones. Added support for Wrye Bash 299. Added support for Nexus Mod Manager. Mod Organizer is untested by me but its reported to work. Wednesday 2012-08-01. Version 1.0 has been released. Major improvement is that it can now be installed with Wrye Bash 299 as well. I want to thank Arkangel for his help to get this working. Support for NMM and MO was already implemented. Friday 2012-08-03: Version 1.1 has been released. AV-tized he last 10 Horse mare textures. Used the textures from AlienSlofs latest update not the older ones. I have contacted AlienSlof and asked her if I could use her excellent textures for an AV Port and she give me permission, for which I'm grateful. This resulted in the creation of the AV Port shown below. 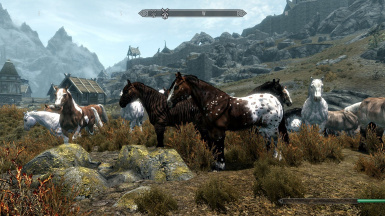 Updates: This release adds 10 more horse retextures (two each for the five different types of horses) and now ALL her horse mare versions are done. Also this releases uses the textures from her 1.1 release, the old AVP used the textures from her first release. She has corrected some mistakes in the 1.1 release. She has also aded a new "Horse Retex Pack 7" AND a Base Retex Pack. 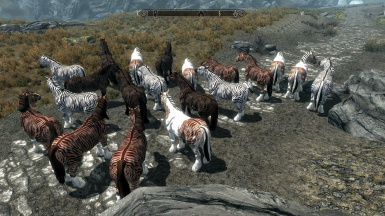 The base retex pack horses look quite a bit like the vanilla ones BUT they still have a different touch to them. Hence 10 new textures. Spport for Nexus Mod Manager, Mod Organizer (untested by me but reported to work by a user) and Wrye Bash 299. The AVP ues the textures of the first released Slofs Horses package, which are mares. Since then she has released a stallion version (all 6 packs) and released a mare pack (all 6 orginal ones). She wrote on her modpage "22 June 2012: Tweaked some mistakes on the base mare textures and added stallions. Both retextures now include the relevant mesh.weaked mares and added stallions to Alt Pack 1, complete with meshes." As AV currently does not handle meshes which mean a Stallion AVP is atm useless because certain parts "do not fit" . If did not notice problems with the mare version though. If AV supports meshes its entirely possible I'm gonna make an Stallion AVP and a redone mare AVP with the adjusted meshes. The zebras are HorseRetex03 as shown in the AV GUI. If you don't like them you can disable them. Before installing the new version you HAVE to uninstall the old version. The fail proof way to do it, which I have checked with Leviathan1753, the author of Automatic Variants. Erase old version Data\textures\AV Packages\Wolverines AV Ports -- Author is AlienSlof" by deleting the directory. Start AV. Optional: (if paranoid) check 'Force patch on exit'. Exit AV and a new patch will be created). The reason for this approach is that sometimes a so called Gather&Exit does not work and that a few files can be left behind. Normally this isn't that much of a problem BUT I have changed the directory structure to allow for easy adding of Stallions when AV supports meshes. In a future version of AV no files have to be moved around and everything will be done with NTFS hardlinks (basically shortcuts). Start the AV GUI, enable the "Wolverines AV Ports -- Author is AlienSlof" AVP and do a 'Gather&Exit'. Goto the "SkyProc Patchers\Automatic Variants\AV Packages" directory and remove directory Wolverines AV Ports -- Author is AlienSlof. Goto the /data/docs/wolverine2710 directory and delete directory AV Port Author is AlienSlof. If there are no other directories in this wolverine2710 directory you can remove it. AlienSlof for the use of her excellent textures.